- The Mummy 3: new behind-scenes video, posters and other updates. - On the 29th, the second press conference for Stellar Entertainment was held in Hong Kong, announcing South Korean actress Song Hye-kyo has joined the company. 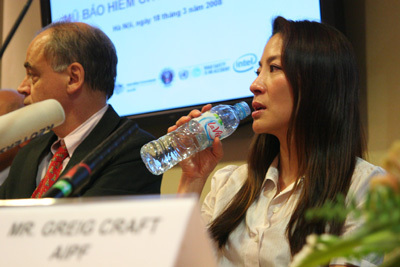 Song Hye-kyo, Terence Chang and David Tang attended the event and a recorded video of Michelle was shown during the press conference. Video from the press conference . Michelle's welcome message is at 00:23 - 00:36, in Cantonese and English. She said she could not come to the event since she's in Africa. Michelle had been in South Africa for a week for the Make Roads Safe global campaign. South African news reported that she was in Johannesburg on Thursday attending an Automobile Association event and also did some filming in Cape Town. - [AN UPDATE TO NOTICE from June 3] First, I'd like to say a big THANK YOU to everyone who has been concerned about my friend Wen in China, regardless of whether you have written to me... After a month of being detained at the Haidian Detention Station, Wen has been transferred to the Haidian Detention Center and she was given a sentence for two years in a forced labor camp (aka. Re-education Through Labor, which is a way for the government to lock people up without the need for charges or a trial). Her family members have not received any legal documentation for the arrest/detention and they were denied the right to visit her. Wen has 60 days to appeal but still, it is extremely difficult to find a lawyer in China who dares to defend Falun Gong due to their own safety concerns. If anyone happens to have information and can help with getting a lawyer (doesn't have to speak Chinese) who is willing to help with the case, please contact me. Initially I had trouble collecting information from China due to the safety concerns for the people I contacted - there in China, phones are bugged, letters are opened, internet/e-mails are censored, and plain clothes police are everywhere. After a few weeks we have managed to build a safe way to communicate and I have collected materials I need in order to present the case to related officials, groups, and organizations. Old classmates and friends of Wen and I in China or overseas have been notified and many of them have been trying to help. Some friends here have showed concern for my own safety (thanks!!). Just to let everyone know I will be all right. I'm not going back to China in the near future. A person who came out from the police station brought a message from Wen. This time when at the detention station she had a relatively "easy" time. Back in 2001, police and their collaborators tortured and assaulted her intensively in order to force her to sign a "guarantee" to never again practice Falun Gong. Now after nearly nine years of the persecution, although there are still many ongoing cases of torture and even death documented, more and more Chinese have realized Falun Gong practitioners are good people and the persecution is wrong. This time police and other prisoners were actually nice toward her. From this change, I see the hope for China! Again, please help support the Millions of Signature Global Campaign, and help stop the brutal persecution. The deadline for signing is July 20th, which is the 9th anniversary of the beginning of the CCP's persecution of Falun Gong practitioners, which, should not have been allowed to have started in the first place. - The Mummy 3: new French and Taiwanese posters. - Babylon A.D.: French pressbook and English translation. - Babylon A.D.: official French trailer. - The Mummy 3 updates: Pictorial moviebook. Release information in Asia. Posters from Taiwan, Hong Kong and Japan. - New in Photos -> Magazines: photos and article scans from "The Bund" (Chinese magazine), June 12 issue. Many thanks to Bin (aka "A Bird")! - Babylon A.D.: Novel re-release information and the cover pic. - The Mummy 3: photos of a M3 display and a new poster. - New title image for the front page. - A press conference about Michelle's recently established talent management company, Stellar Entertainment Ltd. (Chinese name: Xing Cheng Yu Le), was held in Hong Kong on the afternoon of June 21st. Michelle, along with her business partners producer Terence Chang and David Tang (Tang Zaiyang), who is a well-known Taiwanese media personality, as well as some of the artists who have signed on with the company, attended the event. Stellar Entertainment now has offices in Taipei and Hong Kong and plans to extend to Shanghai, Beijing, other Asian regions, Hollywood and Europe. The first group of eight actors were announced, including Kelly Lin (Taiwan), Zhang Fengyi (mainland), Pace Wu (Taiwan), Mark Cheng (Hong Kong), and Brandon Chang. The company has also signed up with some behind-the-scenes talents including screenplay writer Wang Hui-Ling (Crouching Tiger, Hidden Dragon) and several directors. More artists will be announced later of the month. In an interview after the news conference, David Tang Zaiyang said that he will be the main person in charge of the administrative management of the company. Producer Terence Chang focuses on the creation part. The company can bring the talents for the productions Chang produces. "Michelle has good ties and resources in the industry." Tang said, "She is a very warm person and she is the cohesive force to get everyone together as a family." "We aim to nurture new talents and offer guidance to established talents to take them to the next level," said Michelle. During the Cannes film festival last month, reporters asked her if by running her own company it means she is switching her focus away from acting. Michelle said no. She does not have to sit in an office and there are other people in the company who will manage the daily business. "I have two very good partners," smiled Michelle, "what I need to do is just saying 'Hi' 'Hi'." - Another company Michelle is involved in is Jelly Bean Film & Distribution, partnered with Sabrina Chen, who previously worked for Michelle at Mythical/Han. Their current projects are listed at their website. Michelle is leaving Hong Kong today for Africa. - Photo: Michelle at the press conference for her new talent agency, Xing Cheng Yu Le (Stellar), June 21st, Hong Kong. - The Mummy 3: New images. New full trailer with download links. 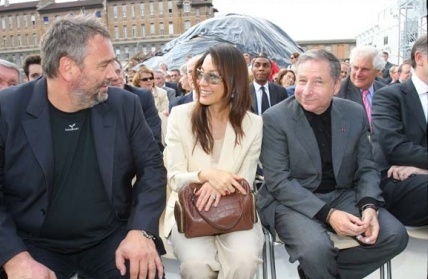 - June 18, Paris: Michelle attending the foundation laying ceremony for ICM (Institute for Cerebral and Medullary Disorders), a non-profit organization which supports the development of research on the brain and spinal cord. - Babylon A.D.: new/HQ images - with Michelle!! - The Mummy 3 updates. Novel information. Book cover and game covers. - Babylon A.D.: Italian release date. - News photos: Michelle and Mr. Jean Todt attending the wedding ceremony of Flavio Briatore, Italian businessman and managing director of the Renault Formula One team, held at the church of Santo Spirito di Sassia on June 14 in Rome, Italy. - Babylon A.D. U.S. trailer. Michelle arrived in Taipei, Taiwan on the evening of June 8th. On the 9th and 10th, she went to Joshua Lin's studio for photoshoots for "BAZAARA" magazine and attended two Audemars Piguet events. She will leave Taiwan on the 11th. Talking about her plans for the summer, Michelle said she will be very busy with the promotion tours for The Mummy 3 and Babylon A.D.. In the beginning of July she will be in South Africa continuing filming the "Make Roads Safe" documentary. After that she will be in Paris for the promotion of Babylon A.D.. She will then travel to Los Angeles, Moscow, Berlin, San Francisco, Mexico, New York, etc.. She laughed at the rumor about her "wedding" in July and said she won't have time. Michelle promised Taiwanese media that she will attend the Golden Horse Awards this year. A press conference for Michelle's new talent agency is scheduled for June 21st in Hong Kong. Excerpt: "Traffic safety plays such an important role in protecting people's health and life. Therefore, what I prioritize most is how to improve the awareness of people all around the world about safe traffic. I came to Vietnam with a film crew aiming to make a documentary about traffic safety before heading for Malaysia, South Africa and India. Whatever the specific characteristics of each nation are, we believe the documentary will give people helpful lessons as well as influencing the authorities for further rational measures to the traffic problem." On the banner: "Welcome Ms. Michelle Yeoh To Tay Son Primary School"
- The Children of Huang Shi updates including Hong Kong poster and a Michelle interview video. "The actress said that while she rode a motorbike without a helmet in the movies, she did not encourage people to do the same." Many thanks to Rachel who sent in the video links and some of the photos from Vietnam! 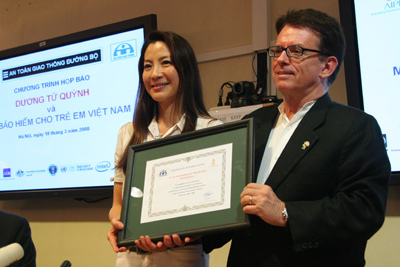 - On March 18th, Michelle attended a press conference in Hanoi held by the Asia Injury Prevention Foundation, the Vietnamese National Traffic Safety Committee and the FIA Foundation. 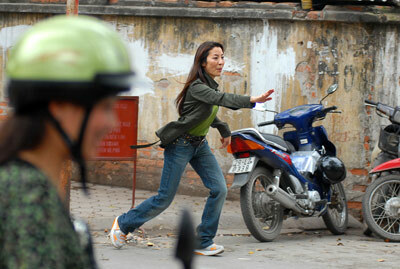 "It is very troubling to see so many children in Hanoi riding on motorcycles without helmets. 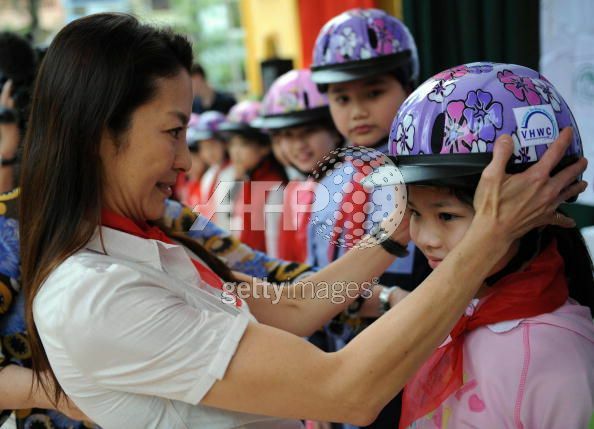 Parents must act right now to put Government certified helmets on their children," said Michelle. 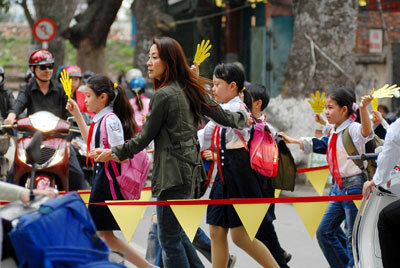 Michelle will stay in Vietnam from March 15th until the 19th as the Goodwill Ambassador of traffic safety. 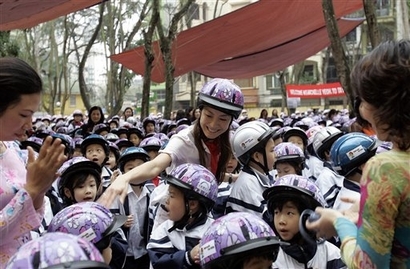 During her visit, Michelle has filmed a public service announcement for Helmets for Kids, participated in a Helmets for Kids school ceremony, visited schools, a protect helmet factory, and victims of traffic accidents. She is also making a road safety documentary to be shown internationally. 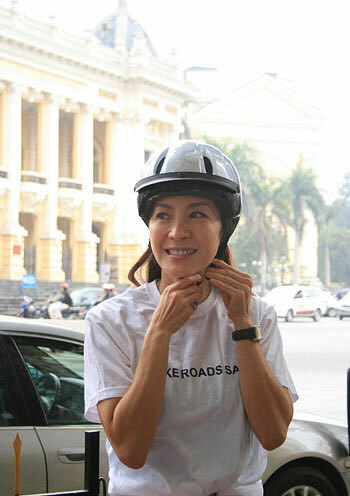 Michelle will be reporting on the great progress made in improving road safety in Vietnam at the United Nations in New York during a key debate on global road safety on March 31. 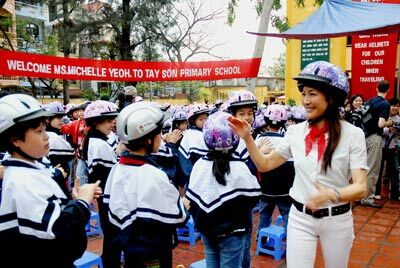 - News photos: on Tuesday March 18th, Michelle, as a Road Safety Ambassador for the "Make Roads Safe" campaign, attending a Helmets for Kids Handover Ceremony held at Tay Son Primary School in Hanoi,Vietnam. "Memoirs of a Geisha" star Michelle Yeoh's jointly owned shingle, Jelly Bean Film & Distribution, is selling its first productions at Hong Kong's FilMart, which opened Monday. Jelly Bean is repping "Remembering History," five high-definition documentary skeins about aspects of Chinese history. Directed over five years by TV and sports helmer Fiver Chen, the 86-episode skeins delve into subjects as diverse as sky burials, paper-making and the Lee family roots. One series examines the ancestry of 14 generations of Tibet's Dalai Lama spiritual leaders and the process of reincarnation. "Just as our company is looking for films from a fresh, different point of view, Fiver was looking to make films with a meaningful approach to history," said Yeoh's business partner, Jelly Bean prexy Sabrina Chen-Louie. "There appears to be good demand for strong HD content." Company has world rights including China to the docu skeins, and Chen-Louie reports strong Chinese interest for all the series except the Dalai Lama episodes, which are too politically sensitive after the recent Tibetan unrest. Yeoh was previously co-owner of Hong Kong-based shingle Han Media ("Silver Hawk") but has recently concentrated on her acting career. - The Mummy 3: new official production photos (no Michelle). A description of the teaser trailer. 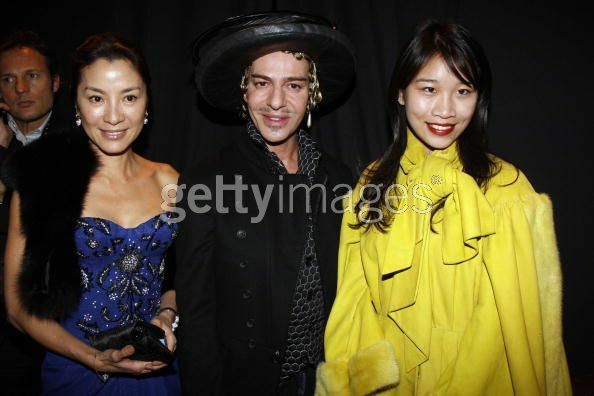 - On Friday March 14th, Michelle attended the opening ceremony of the new Louis Vuitton shop in Hong Kong. - The Children of Huang Shi: Taiwanese release and poster. 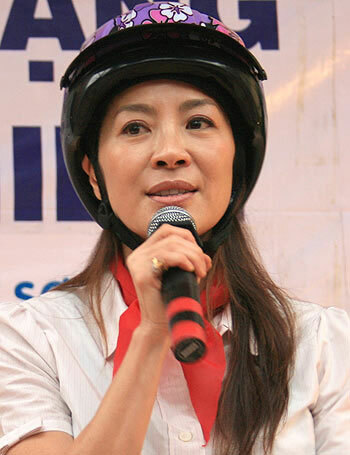 "Renowned Chinese Malaysian film star Michelle Yeoh will speak at a press conference in Hanoi on March 18 at the World Bank Vietnam Office, to give her support to a children's road safety initiative. 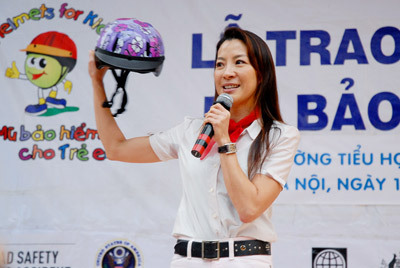 The event is being held by the Vietnam Helmet Wearing Coalition (VHWC) and the FIA Foundation for road safety campaigning and research. 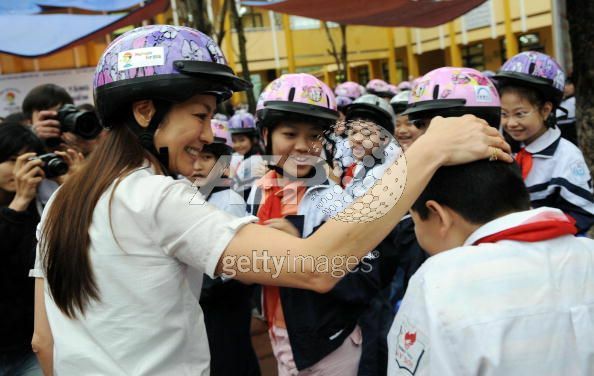 A panel of VHWC members will be on hand to discuss the upcoming Phase III of the National Helmet Wearing Public Awareness Campaign, focusing on children's helmet use and road safety education. 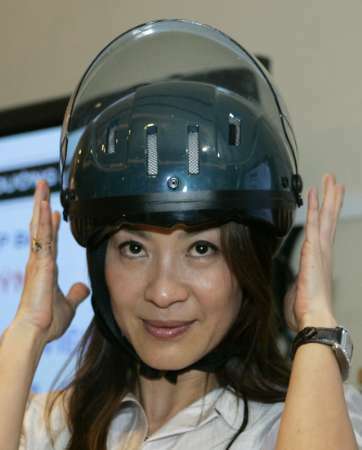 In addition, Yeoh, a Road Safety Ambassador with the FIA Foundation will discuss the organization's efforts to highlight the importance of children's road safety worldwide, as well as upcoming road safety activities of the United Nations." - Another The Mummy 3 poster from the ShoWest (with Michelle). - Video in Far North: Asif Kapadia talks about the film at the Glasgow Film Festival. - Babylon A.D.: a photo from the Paris Tuning Show. - The Mummy 3 updates. A video clip and several photos from the Hengdian set (no Michelle). - The Mummy 3: teaser poster. - The Children of Huang Shi updates: A poster of Michelle and a "story" behind the Chinese posters with Michelle. - The Children of Huang Shi updates: Hong Kong media reported that the main reason Michelle is skipping the film premiere is there is a schedule conflict. Also, Michelle's appearance in the film is as a guest star, and modestly, she does not want to attract a lot of attention to herself. 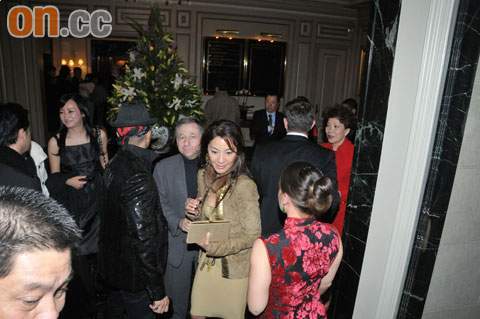 Michelle's assistant said she will be in New York attending a charity event on March 31 as a "safety ambassador". Also new in the section are the title pic and a promotional MV. - Michelle will not attend the Chinese premiere of The Children of Huang Shi. - Far North: video of Michelle's "Blatt Lerret" session at TIFF last month. - Far North videos: film clips and interviews (featuring Michelle). - The Children of Huang Shi updates: release information and two videos (no Michelle). - Sunshine updates: Fox "Sunshine" DVD website. Michelle was named Best Supporting Actress by PopMatters for her performance in Sunshine. - The Children of Huang Shi: Chinese official website, wallpapers, and and other updates. - Audio: Fashion interview with Michelle (01:18). It was recorded two years ago at a Roberto Cavalli fashion show. - Far North: Exclusive from the TIFF last month - director Asif Kapadia's "Far North" presentation and a film clip from it. Many thanks to Karl and BAM! - The Children of Huang Shi updates: Australian official website is up with a trailer and many photos. A video clip on the film making with Michelle. - The Mummy 3: Rob Cohen has updated the official blog and a new video is available. - The Children of Huang Shi: the U.S. release date - May 23rd - is official. - Far North: Image Entertainment has acquired the North American distribution rights for the film. It would be a big disappointment if it means no theatrical release in North America! - The Mummy 3: video interviews with crew members. - The Children of Huang Shi: Chinese movie novel and some images. - The Mummy 3 Montreal set construction photos. - Babylon A.D.: MPAA rating. - Michelle is in IMDb Daily poll, go vote! [poll closed 02/02] (thanks Sean) She was listed no.7 in "Entertainment Weekly" recently selected the TOP TEN BEST BOND BABES. - Far North will be screened during the Berlin International Film Festival (European Film Market) and the Glasgow Film Festival in February. - The Children of Huang Shi updates. The film will also be screened at the European Film Market in Berlin. - On Sunday January 27, Michelle attended the Prix d'Amerique Marionnaud trotting race at Vincennes horse track outside Paris and the reception dinner at Cite Nationale de l'Histoire de l'Immigration in Paris. - The Children of Huang Shi U.S. release date: May 23. Limited. The Make Roads Safe campaign, led by the FIA Foundation, is calling for UN and G8 action to reduce road deaths and injuries in developing countries. Road crashes already kill on the scale of malaria or tuberculosis and are the number one killer of young people under 25. Road deaths in some developing countries are forecast to double by 2020. The campaign is organising a global petition to the UN urging support for a first ever global governmental conference on road safety. On 31 March 2008 the United Nations General Assembly is debating a resolution on the 'global road safety crisis' calling for a UN Ministerial. - Far North: information on U.K. distribution. - Video: A Message from Michelle on the Make Roads Safe campaign. - The Children of Huang Shi: Chinese official trailer. - "WWD" Report: Michelle Yeoh won't have trouble keeping in touch while traveling around Africa, Vietnam and India for an upcoming documentary. "I'm designing my own phone," the Chinese actress revealed at the Dior couture show Monday, noting her partner is luxury phone brand Vertu. 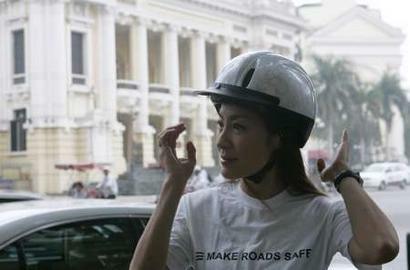 Yeoh will be ringing up roaming charges as she tours Africa and Asia while working on "Make Roads Safe," an international campaign on road safety. "I was horrified to learn about the shocking number of deaths that take place on unsafe roads," she said. "I felt compelled to do something about it." 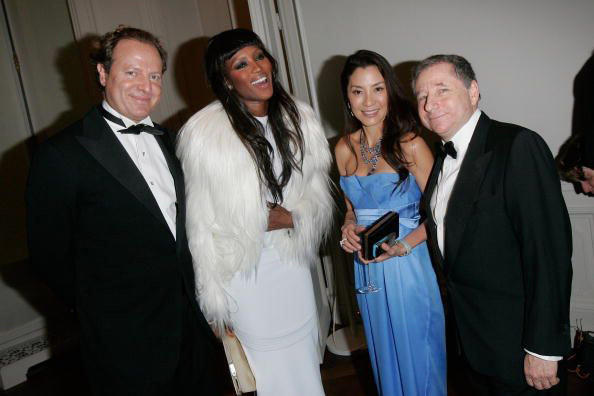 - In the evening of January 21st, Michelle and Mr. Jean Todt attended the 150th anniversary celebration of Boucheron (a French jewellery house) in Paris. - News photos: Michelle attending the Christian Dior Fashion show, during Paris Fashion Week (Haute Couture) Spring-Summer 2008 at Polo de Paris in Paris, France, Monday January 21st. 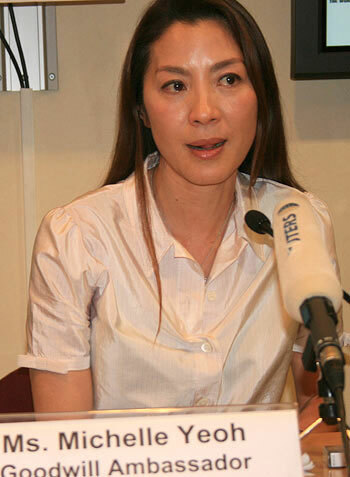 During the Tromso press interview with Michelle on the 18th, reporters also asked about her other projects. Michelle said she just finished The Mummy 3 and the next film to be released is The Children of Huang Shi. Currently the most serious project she's working on is a documentary about traffic accidents and how to secure the roads, under the UN's umbrella: Make Roads Safe. "As a matter of fact a child is seriously injured or killed every 30 seconds throughout the world, which makes the traffic the worst death factor for children on this globe. And I am very proud to work with the United Nations on this," said Michelle. Michelle said the vast influence the Arctic had on her personality will follow her for her whole life. 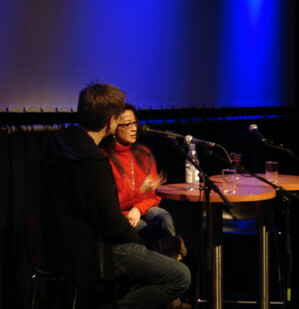 For more photos of Michelle in Tromso please see Far North, exclusive report and photos from TIFF. - Far North: exclusive report from TIFF, by Karl A. Roman. Michelle has left Norway for Paris. - The Children of Huang Shi: a trailer. 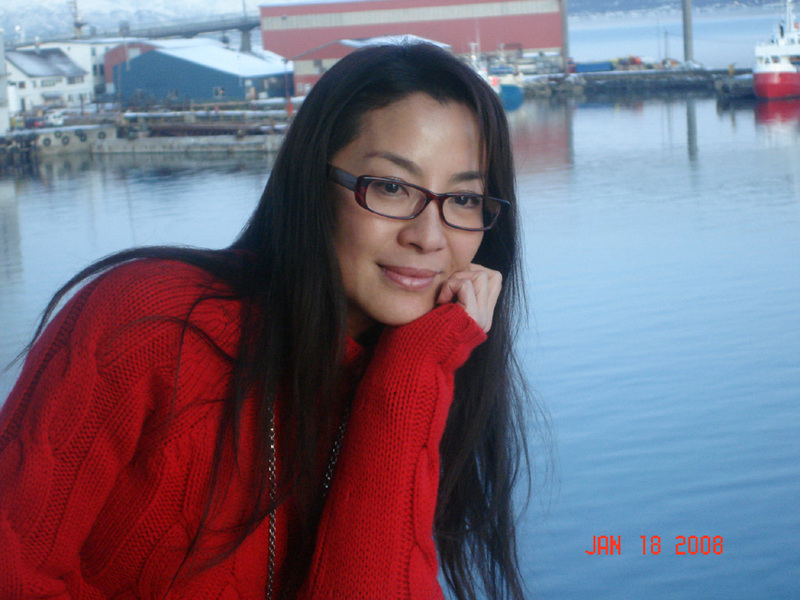 - Michelle arrived in Tromso in the afternoon of the 17th. See photos in Far North news. - The Mummy 3: an interview with Brendan Fraser. Some set photos. 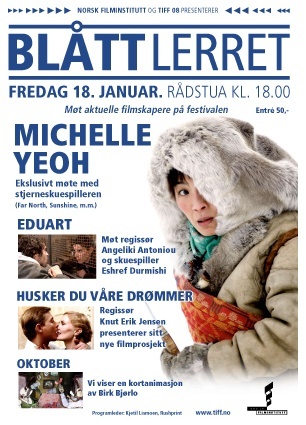 - Far North: Michelle will be at TIFF's BLATT LERRET on Friday January 18th, for a special session: "From South - Far North: exclusive meeting with Michelle Yeoh". - Far North - expect it in cinemas. 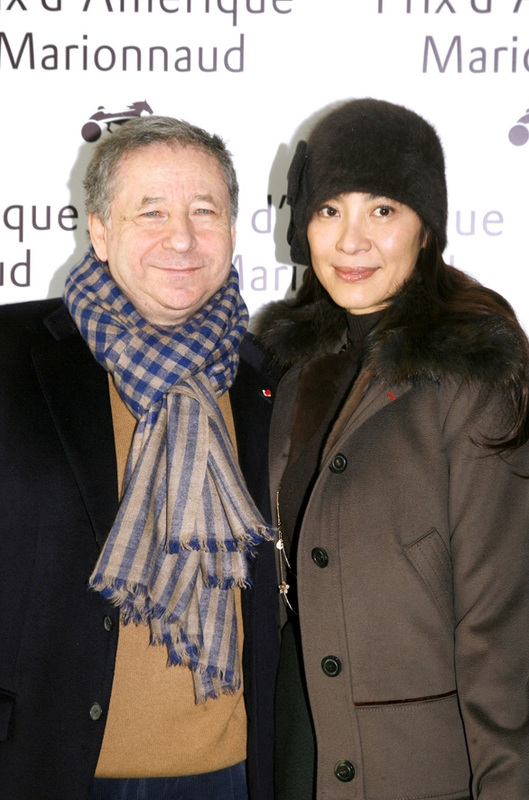 - More photos from Paris: Michelle, Mr. Jean Todt, Corrina and Michael Scumacher at the premiere of Asterix aux Jeux Olympiques, Jan. 13. - Walking down the Champs Elysees, Jan. 14. - On Jan. 13th, Michelle attended the premiere of the film Asterix aux Jeux Olympiques in Paris. The film is directed by French directors Frederic Forestier and Thomas Langmann. 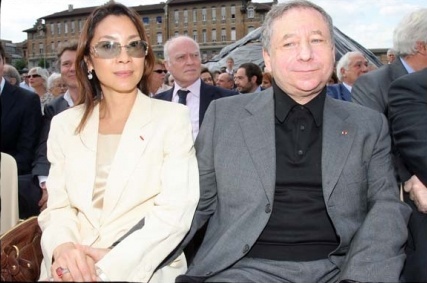 Mr. Jean Todt, Ferrari CEO and former F1 German driver Michael Scumacher made cameo appearances. 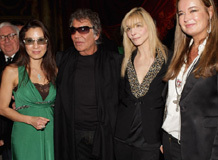 During the recent two weeks, Michelle has been in Hong Kong, Malaysia, Italy, and France. Soon she will be in Norway for the film festival in Tromso. - The Mummy 3: more set photos. - Far North: TIFF event, Longyearbyen screening, and new photos (with Michelle). - Far North will have three screenings at the Tromso International Film Festival next week. Michelle is scheduled to attend the festival. - The Children of Huang Shi: release date in China and a Chinese poster. - The Mummy 3: new production video from Rob Cohen's blog. 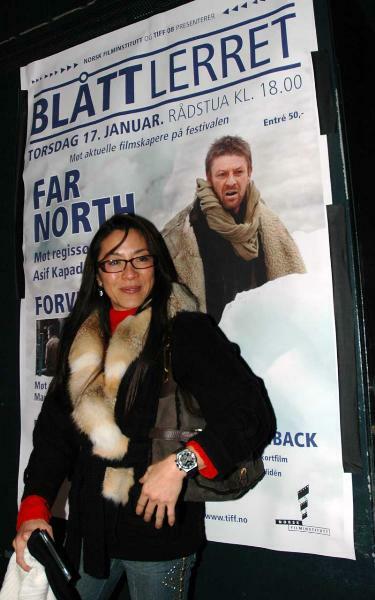 - Far North: set photos with Michelle, and some screening information. - The Children of Huang Shi updates with two images.